The Collective!! Friday at the Lord Clifden, Hockley , 9pm – 1am, Free Entry. The Collective was born in September 2010, when Steve Thornton, a local promoter and a regular punter at the Lord Clifden noticed a lack of diversion in the music. “Things seemed to get stagnant with the music, sort of a groundhog experience”, claims Thornton. With only 1 regular DJ on the rota on a Friday, Thornton saw a gap in the market where he felt he could expose. There has always been something special about the Clifden. You only have to venture inside, noting the Banksy Artwork, labyrinth like venue and oasis like beer garden, immediately taking you out of the concrete surroundings and hiding you away to note that this is a venue that’s got character. “The Clifden manager Graham Smith has always had an ‘eclectic’ take on music policies that isn’t chart music or what all other bars are playing”, says Thornton. “This is why I came to be a regular, enjoying music that was different from the bars up and down Birmingham”. Clifden manager Smith is an ex DJ, a lover of all genres and his passion and an extensive collection of vinyl behind the counter, on display, underlines this. With that Thornton knew what sort of music he was looking for, and what sort of music that would best fit the taste of the manger, the punters and the venue. That is when the idea and the night “The Collective” was created. His vision was to have a night to showcase a ‘Collective’ of DJ’s with a collective taste in music, bringing their personal record collection to the venue, giving a similar sound in terms of genres, but differing due to records selected. “I wanted the music to have inclusions of certain styles (disco, soul, funk, mod, Ska) but for all DJ’s to dig into their record box and each week supply a different sound” says Thornton. Thornton books DJ’s based on their passion for music. He also understands that The Collective has to cater to wide audience, not affecting the attendance because of the diverse age ranges and social groups. He has big ambitions for The Collective and the night itself, “The aim is to build a strong brand that is known for its music, something for everyone and not a chin-stroking night”, maintained from the quality of DJ’s that spin each week. Thornton believes that the area has a good eclectic presence at the moment, with the likes of RVT and Vertu also having a similar soundtrack in terms of music diversion and policies, replicating a positive plus in the Jewellery Quarter area. To this date, The Collective has already scalped 2 local talents that span in November 2010. Dean ‘Sunshine’ Smith has played at the Garden Festival in Croatia, a DJ who has been in and around the scene as a DJ and producer, for a number of years, in fact tracing back to the days of the first summer of Love! Another local talent that graced the Collective turntables is Paul Kaminski, one half of local DJ duo, the Discomendments. Kaminski has played lots of venues in and around Birmingham and is also another Garden Festival regular. Having these two DJ’s and some other big players playing at the Clifden, shows how serious Thornton is taking this night and where he wants to take the brand to in the future, which I believe is very possible. So what are Steve Thornton’s credentials? Well he’s been promoting for a solid 12 years, so he’s not wet behind the ears, he knows what he’s doing. He began his craft working for Godskitchen, starting as a street flyer before working his way up in becoming head promoter in the early 2000’s. He also worked on the 2nd ‘Global Gathering’festival that housed 40,000 clubbers and dancer lovers alike. After a brief spell away from it all, going travelling, recharging the batteries and falling back in love with the scene, he didn’t wait around for anything and immediately started a night called ‘Tension’, which ran for 3 years. Building something from scratch and self-funded seems to have given Thornton that determination for success. For Tension, this was apparent as he got the brand involved in hosting backrooms in conjunction with likes of Renaissance, Underwater, Eclectricity, Pete Tong, Ultra+, Sundissential, DJ Sneak, Layo & Bushwacka, to name but a few. On top of that after Tension ceased, he became one of the promoters for ‘Dex in the City’ alongside local and now worldwide DJ Paul Thomas. So what’s he doing now, Just promoting this night? Messing around getting pissed? Well, yes he is doing those things but he’s also one of the promoters at Habit which is a bi-monthly house and disco night at Bulls Head, Moseley, alongside Andy Price, Mat Jones & James Roberts. This project has been going on for 5 years, his longest club night to date. As well as promoting he’s started to DJ again, after he toyed with it in the late 90’s and realised he wasn’t very good at it nor had the commitment. This may have been fate as it pushed him into the promotion side of things. But he’s tidied up his skills, got back into the music and now plays regularly for Kitchen Disco, Habit, Loose Joints, Republic of Sound & is the resident at the Collective. His passion for the music, the scene and for putting on events, 12 years since his first step into the scene, shows no signs of stopping. What’s next? Who knows! 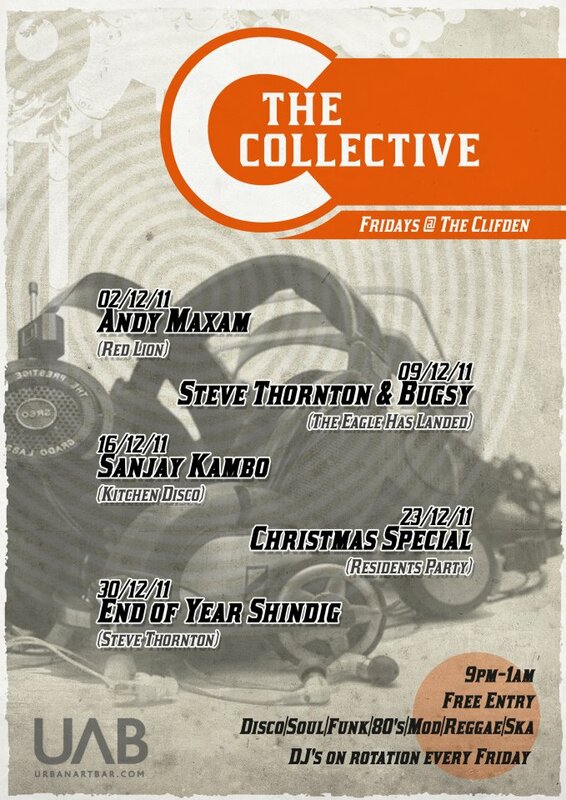 The Collective is every Friday at the Lord Clifden, Hockley, 9pm-1am, Free entry. Next Next post: Arctic Monkeys – R U Mine?